Pack size: 40 Pieces - supplied in 250ltr retail-ready plastic stillage. This amazing water-worn limestone rock has an unconventional source. The stones are collected from fields to enhance the soils of organic farm high in the mountains. Selected stones are locally cleaned to provide a unique contorted and cavernous rock especially suited to aquaria, and decorative displays. 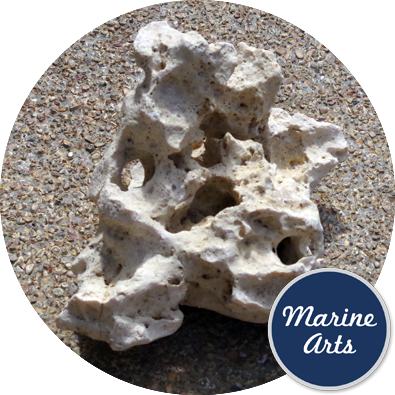 This "coral rock" has been sold in Germany for many years, and is now available exclusive to Marine Arts in the UK. Use this "big box" with 40 pieces of coral stone as a convenient and compact retail starting point. AS sales progress top-up with loose coral rocks, product code 1961.